Plan to grab one (or two) on your way out the door in the morning – they’re perfect for a quick breakfast! Big ol’ thanks to Betsy of A Cup of Sweetness for hostessing this week. 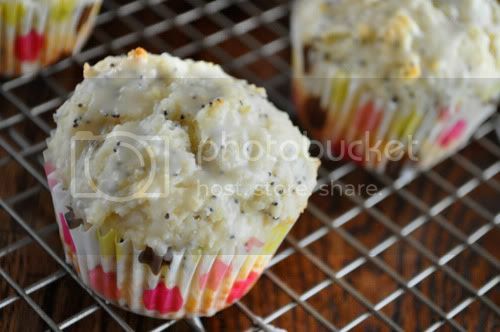 Click over to her blog for the recipe, then check out all the other TWD muffins from the list of bakers here! p.s. I’m celebrating MBH’s 3rd blogiversary this week! Have you entered my giveaway yet?? Filling these with jam is brilliant. I am planning to to do this. I bet, we will love them. love the inclusion of the jam! I have some blueberry jam to use up, maybe I’ll try this! I love lemon muffins too. Next to blueberry they are my favs. Your muffins look amazing. The jam addition sounds perfect! Great photos! And I love the liners – very cute! The strawberry jam is a great idea! I think I will try the jam variation next time. Love these gems! I would have to grab more than one or two because they look super super delish girl! Blimey! I wish I had filled these with strawberry jam. Your muffins look luscious! I love those cute wrappers. 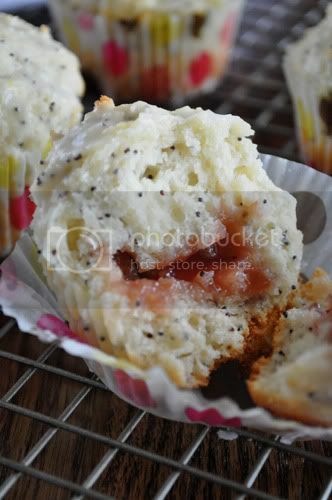 Love that you used strawberry jam as a filling! I could eat strawberry jam on just about anything sweet! Wow they look so good..way to add some jam to the center! I loved this recipe! Oh, the strawberry looks so good!! Pretty muffin liners, too. These look good, especially the strawberry jam inside! Cute muffin papers. I love that you used strawberry jam in the middle- I bet that made these even more delicious. They look great! I WILL be making these again–I think with orange zest and some kind of filling. Yours look great! 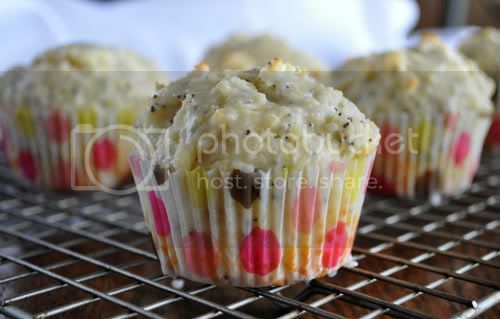 Your muffins are so adorable in their spotty wrappers with their red hearts. Love it! That is a flavor marriage made in heaven! Thanks for baking with me this week. I am also a Native Texan but unfortunately I don’t live in Texas anymore. Your muffins look great. I didn’t think they could get any more delicious but your jelly addition looks great! I love your photos and those cupcake papers are adorable! I am obsessed with decorative cupcake liners. definitely makes me think of sunshine! i like your muffin papers. and happy, happy blogiversary! Previous post: ‘My Baking Heart’ is 3 Years Old! !